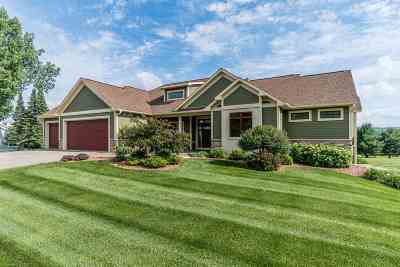 Gorgeous views of the Baraboo Golf Course and the Bluffs from this stunning ranch home with a walk out lower level. Gourmet kitchen with custom cabinetry, granite counters & high end appliances. Open concept living area with a wall of windows, built-in cabinets & a gas fireplace. Spacious mstr suite & bath equipped with a walk in tiled shower, his & her sinks, heated floors & a separate soaking tub. Beautiful Sun Room, custom built wet bar, laundry and an office complete the main level. Lower level features a large family rm with patio doors, 3 bdrms, full bath, storage and a golf cart garage. Directions: S Blvd To South On Walnut St (Turns In To County Rd Dl), Left On Inverness Terrace Ct.